To what extent do cloud and managed services provide you with the following benefits today? Rate on a scale of 1–5, where 1 = Not at all and 5 = To a great extent (Top-2 box scores). Click to enlarge The story changes somewhat depending on the industry (we surveyed healthcare, government/education, retail, financial services, and professional services) under consideration. For instance, while healthcare is seeing collaboration among business units as a top benefit, it is significantly less likely to see improved product and service offerings (27%) and alignment with customer needs (27%). 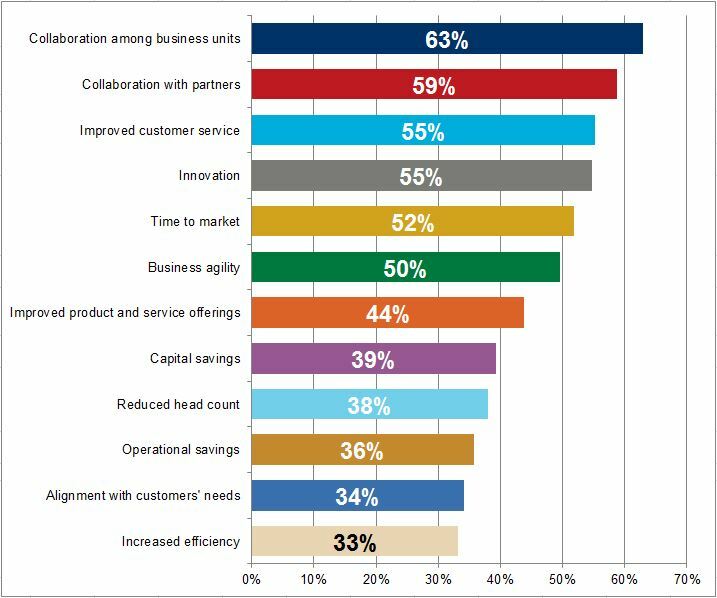 Government/education sees business agility as its number one benefit (66%), but is less likely to report collaboration among business units as a top benefit (54%). The retail industry is seeing outsized gains when it comes to time to market (62%) and alignment with customer needs (43%). Professional and financial services are split on increased efficiency; 44% of financial services firms say it’s a top benefit, while only 26% of professional services firms say so. The split is opposite when it comes to business agility—59% of professional services firms see it as a top benefit, while only 37% of financial services do. Professional service companies are also significantly less likely than the total to report time to market (42%) and innovation (43%) as top benefits.